Their graceful appearance and peaceful coo makes the dove a beloved sight for all bird enthusiasts, and their lifetime commitment to their mates can be a lesson to all lovers. Encouraging these beautiful birds to make their nest near yours can be simple with the right construction from dove-friendly materials, and a strategic location any dove would be proud to call home. Nearly 450 million doves take to the American skies, making your chances of drawing them to a tree near you pretty favorable. Doves aren't fans of your typical birdhouses, but a simple nest from materials you can gather in your own backyard can create a lifetime residence for these winged neighbors. Wild doves and those raised in captivity prefer a similar shallow nest. The cone isn't for ice cream alone, it can serve as a basic style for creating a nest sure to draw a family of doves. The cone-style nest makes a great foundation in which a dove can build her nest, and is far more secure than the flimsy home a bird might create on her own. Wire screen cut into a 12-inch circle, with 4-inch pie slice cut out of it, is the first piece of the cone nest puzzle. Once you've gotten this step completed, shape the large piece of screen into a cone and secure where it meets with twist ties or floral wire. Take great care in forming your cone, as these materials can cut a human hand. They can be equally dangerous to the dove, so make certain no sharp edges remain inside the cone. Wrapped wire to close the cone can help keep a newly arrived dove family safe from harm. Container nests also work well for doves, and a milk jug with an opening large enough for a dove to move in and out of easily can create a suitable foundation. Make certain the entryway has no sharp edges, and secure the jug properly when placing it outside. Certainly, the dove is more than capable of building her own nest from the foundation you provide, but if you want to create something in move-in condition, thin twigs, 4 to 5 inches long, pine needles, bits of paper or cotton, and straw are all materials with which the dove can create her final product. The dove-friendly nest is imperative for luring these winged lovelies to your yard, but location is equally important. 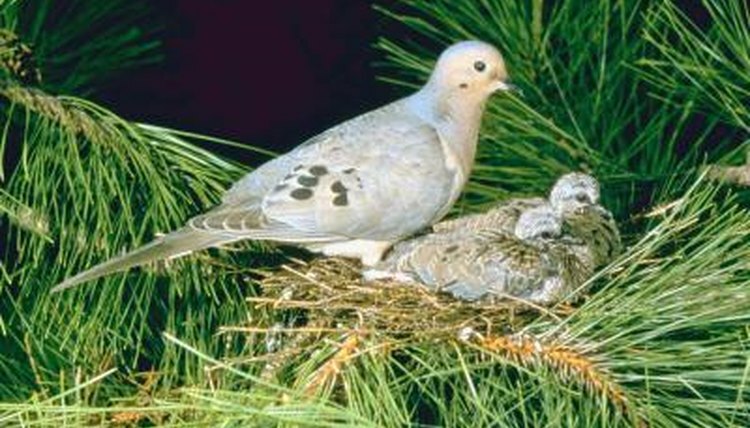 The nest should be high enough to prevent predators from threatening the dove family, at least 5 feet above the ground. The container nest can be secured to a branch with suitable foliage cover using something as simple as a reworked coat hanger, and the cone nest can be attached directly to a tree in a shaded area with fasteners available at a local hardware store. Doves normally will return to the same nest to raise multiple offspring, so creating a place for them to do so safely can provide enjoyment year after year.